"57 of The Best Battle-Tested, Appointment-Setting, Client-Getting Marketing Tips Financial Advisors Have Ever Seen!" Have you ever wondered why some advisors are super successful, while others struggle to find prospects? Has it ever occurred to you that maybe they know something that you don’t know? Then I discovered that if you want to achieve a particular result, all you have to do is follow the steps of people who have already been there. That’s what I’ve put in this 100% FREE PDF download. Just 57 of the best financial advisor marketing tips, ideas, and strategies that are working right now. Click the button below and download your copy now. This is a free PDF download that is sent directly to your inbox. You can read it, print it out, highlight, and take notes if you want. The single biggest complaint clients have about their financial advisors (and how you can use it to your advantage). Page 8. Two dirty little secrets that can get you more referrals than you can handle. Page 13. How to position yourself as the expert in your field so people come to you, not the other way around. Page 16. One little tweak to your presentations and seminars that can dramatically improve your response rate. Page 18. "If This Is So Good, Why Are You Giving It Away for Free?" Simple. I’m a marketing consultant who works specifically with financial advisors. I’m making this offer with the idea that you’ll be very impressed with what I’m giving you today, and you’ll want to do more business with me in the future. I’m betting that you’ll enjoy the book so much, you’ll check out some of the other products and services I offer. Pretty straightforward. 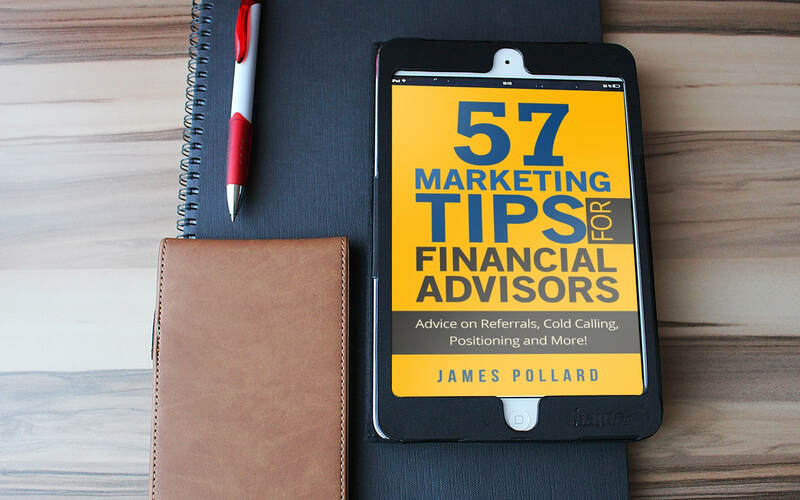 I’m offering you a 100% absolutely free PDF download of my book, “57 Marketing Tips for Financial Advisors”. This is how I get consulting clients, plain and simple. If you like what I have to offer, you can apply to become a client or purchase some of my paid products. I just want to show you that I can help you and provide some value in advance. Click the button below to download your free copy now.